A close encounter is a UFO sighting where the object is close enough to show appreciable angular extension and considerable detail, in which stereoscopic vision is effective and physical contact with the object is considered a real possibility. Strictly speaking, because human stereoscopic vision is limited to a range of about 3 meters, a close encounter would mean that the UFO would have been within 3 meters of the observer. Therefore it is generally accepted that the intent of the definition is to ensure that there are enough visual cues by which to gauge the distance of the UFO with reasonable accuracy. Generally this means the UFO would be within a few hundred feet of the observer. However if a larger UFO passes between the observer and a more distant landmark, the sighting can still be classed as a close encounter. 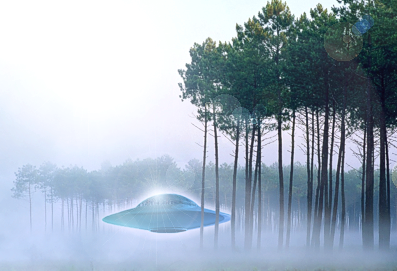 For example, in the artist's rendering on this page we see an alien ship hovering in the forest. Because it is hovering between two stands of trees, one in front of the craft, and the other behind, the craft's position and size can be determined with reasonable accuracy. The phrase close encounter was coined by astronomer J. Allen Hynek for use in cataloging UFO sighting reports. In his 1972 book, The UFO Experience, A Scientific Enquiry he outlines a three tier three hierarchy of close encounters ranging from mere observation of a UFO ( CE-1 ), to the UFO interacting with the environment ( CE-2 ), and the observation of animated entities ( CE-3 ). This third type became the subject of the 1977 science fiction motion picture Close Encounters Of The Third Kind. Since then sighting classification systems have evolved to accommodate a wider variety of experiences and their reliability. in 1990 the French astrophysicist Dr. Jacques Vallee published Confrontations, in which he expanded on the Hynek system by organizing sightings into four main types consisting of five sub-types each. This system includes interaction with animated entities ( CE-4 ) and physical changes to the witness as a direct result of the UFO experience ( CE-5 ). The Hynek/Vallee classification system remains the standard among ufologists today, but is often misquoted by the media and armchair UFO enthusiasts who mistakenly think there is a sixth kind ( CE-6 ) for alien abduction. Under the Hynek/Vallee system, contactee and abduction claims can be classed as high as CE-4 or CE-5 depending on the level of interaction and physiological consequences. There is simply no need for a sixth kind other than to promote sensationalist entertainment. For a more detailed explanation of UFO sighting report classification, see the Sighting entry.